Along with lower costs, significantly more efficient photovoltaic solar is the breakthrough many people around the world are working towards, hoping for, and even counting on in the years ahead. Now a Stanford University team is claiming a breakthrough in the making of less expensive and more efficient solar panels, by adding a layer of organic molecules to solar cells. To achieve the breakthrough, the researchers worked with this technique on a reasonably new kind of solar cell that uses small particles of semiconductors called quantum dots. These are less expensive to produce than more traditional silicon cells, but they haven’t become popular because of ther inefficiency relative to silicon based cells. Solar cells made from a single material have a maximum efficiency of 31 percent, which is fixed by the level of energy they are able to absorb. Quantum dot solar cells don’t have this limitation. Professor Stacy Brent, a chemical engineering professor at Stanford, and her team tried coating a quantum dot solar cell with a very thin layer of organic molecules. 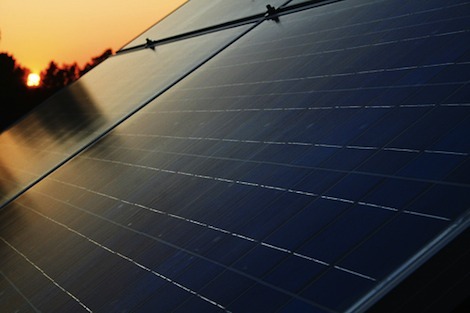 Even at less than a nanometer thick, it tripled the efficiency of the solar cells. Professor Brent has said, “I wondered if we could use our knowledge of chemistry to improve their efficiency,”. It looks like they have succeeded. The team has cautioned that there is still work to be done, as the type of quantum dots they’ve been working with are not ideal for solar cells, so other molecules will be tried for the organic layer. The light absorption of the solar cell itself also needs to be worked on. The team has yet to optimize the solar cells. They have said that once they tune various aspects, the tripling of efficiency caused by the organic molecule layer could be even more pronounced. This is more great news for solar, especially if it does lead to significantly reduced costs and higher efficiency, and consequently to mass adoption of solar technology. And let’s not forget that previous research originating from Stanford in another area, from a couple of post-grad students, resulted in a significant enterprise called Google.